Samyang is best known for its manual focus fixed focal length lenses. It has been branching out into autofocus optics for other brands, but the Samyang AF 14mm f/2.8 F is its first autofocus lens for Nikon DSLRs. Designed for full-frame FX-format Nikon DSLRs, its 14mm focal length gives it a super-wide angle of view of 116.6 degrees, and its maximum aperture of f/2.8 should make it handy in low-light. On APS-C DX format Nikon bodies it will give an equivalent focal length of 21mm, which is still pretty wide, and handy for owners of these cameras since there are fewer prime lenses for the smaller DX-format. The optical design is sophisticated, consisting of 15 elements in 10 groups, with 2 aspherical elements, 4 high-refractive elements and an extra-low dispersion ED lens, all to minimise distortion and chromatic aberration and to maximise resolution. It also has 7 rounded aperture blades to help create smooth bokeh in out of focus backgrounds. There’s an auto/manual AF/MF switch on the lens barrel, and a minimum focus distance of 20mm. This should make it easier to focus on objects close to the camera and exploit the dramatic perspectives and size differences that ultra-wide lenses can create. 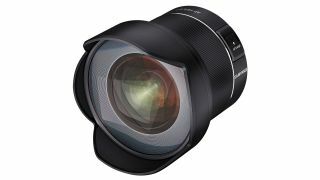 Clearly designed as a premium quality prime lens rather than as a budget offering, the Samyang AF 14mm f/2.8 F also incorporates weather sealing. As a prime lens, though, it’s still light compared to a typical ultra-wide zoom, weighing just 484g. Samyang has raised its game compared to its previous 14mm f/2.8 autofocus lenses, claiming faster and more accurate autofocus in this new Nikon-fit version. The Samyang AF 14mm f/2.8 F will be available from September 2018 at a UK price of £649.99, US and Australian price to be confirmed.